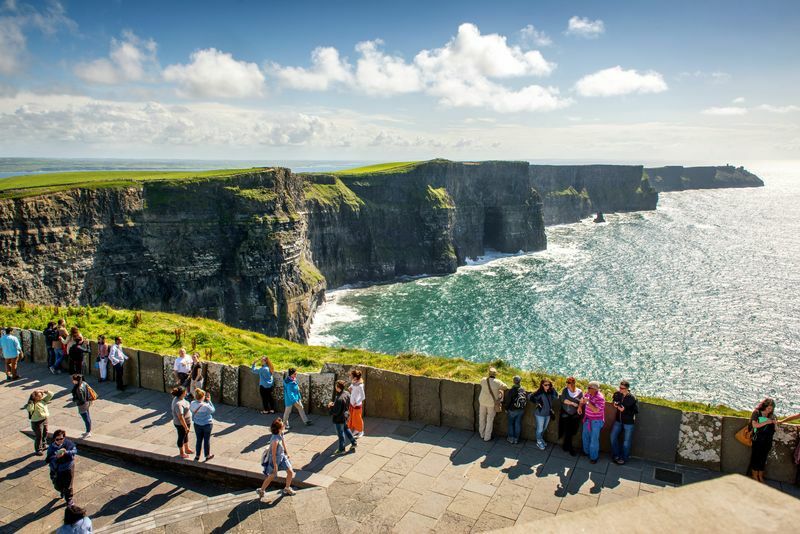 The Cliffs attract around 1.5 million people per year. Second only to the Guinness Storehouse in Dublin in terms of the highest attraction visitor numbers in Ireland. One of the more less known facts, is that the Cliffs appeared in this legendary film released in 1987, as “The Cliffs of insanity”. Other film appearances include: Ryan’s Daughter & Harry Potter & the Half Blood Prince. Formed during the upper Carboniferous period, you will see layers of of Namurian sandstone, siltstone and shale. The oldest rocks being at the bottom, which is why you see so many varied colours. You can spot a huge range of wildlife in the area from grey seals, Dolphins and basking sharks to Atlantic Puffins. The Atlantic puffins live in big colonies at isolated parts of the cliffs and there are estimated to be 30,000 pairs present at peak season. The Cliffs of Moher take their name from an old fort called, Mothar or Moher, which was at Hag’s Head. It was destroyed in 1808 to supply material for a lookout tower (Moher tower), which was intended to warn of a French invasion.